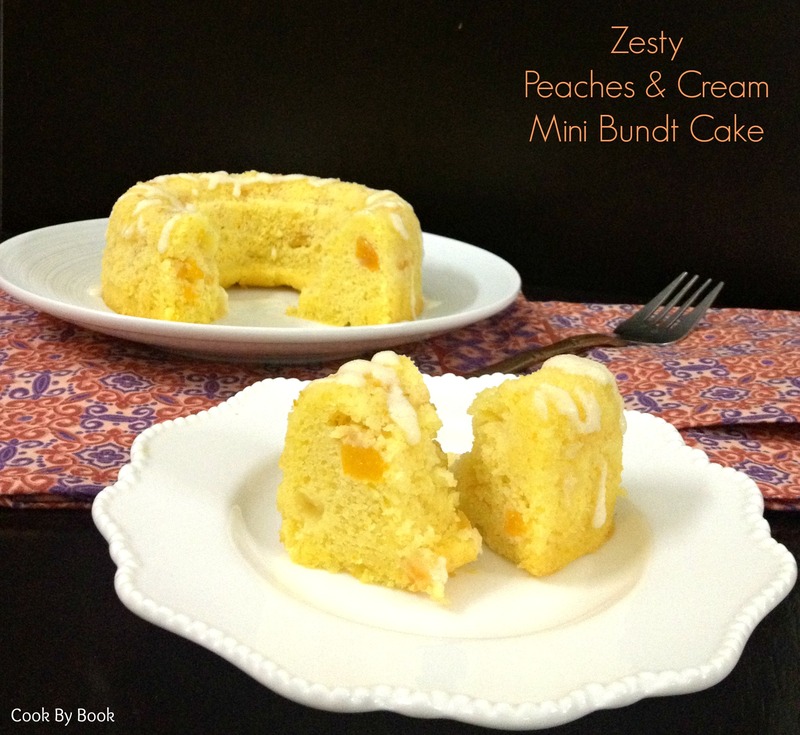 The combination of orange, peach and cream cheese is blow-your-mind-off-amazing! This mini bundt is supremely moist unlike the dry, crumbly pound cakes we all dread. It turns into a piece of heaven drizzled with the vanilla glaze. Isn’t this mini size so cute! Give this a go before the peach season officially ends. Preheat the oven at 160°C / 325°F. 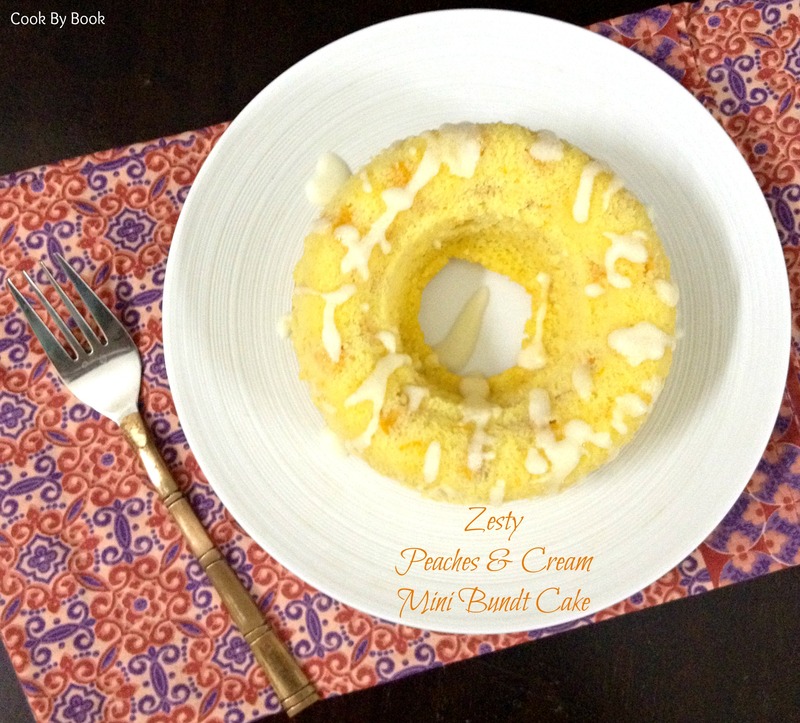 Grease 6-inch mini bundt pan with oil/butter. Set aside. Put the prepared peach cubes in a bowl. Sprinkle the peach cubes with all purpose flour. Stir lightly, just until peach cubes are coated with the flour. In a medium mixing bowl, add orange zest and sugar and rub it together with your fingers to release the natural oils from the zest. Add butter and egg to the bowl. Cream together butter, egg, sugar & zest with the whisk or using hand held mixer. Whisk in cream cheese, orange juice, vanilla and orange extract. Slowly and carefully, mix in all purpose flour, baking powder and salt. Do not overmix. 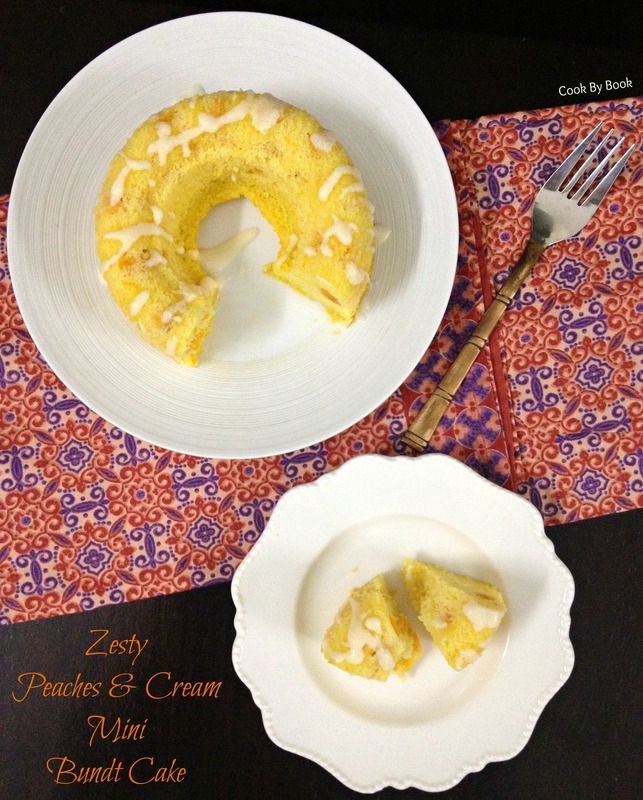 Fold in the prepared peach cubes to the cake batter and pour the batter in the prepared bundt pan. Bake for 26-28 minutes or until the toothpick inserted in the center comes out clean. Let the cake cool in the bundt pan for 5 minutes before inverting on a cooling rack to cool completely. For glaze: Combine powdered sugar, vanilla extract and milk, adding a teaspoon of milk at a time until glaze reaches desired consistency. I love popsicles any time of the day. Be it for breakfast, an afternoon snack or dessert. I mean who doesn’t, right?! This one here is so refreshing and healthy without addition of any sugar, be it refined or unrefined. Just some fresh fruit pieces blended along with little bit of fruit juice. It’s a perfect pick-me-up treat using all the gorgeous summer bounty on offer. I bet you can’t stop at just one! 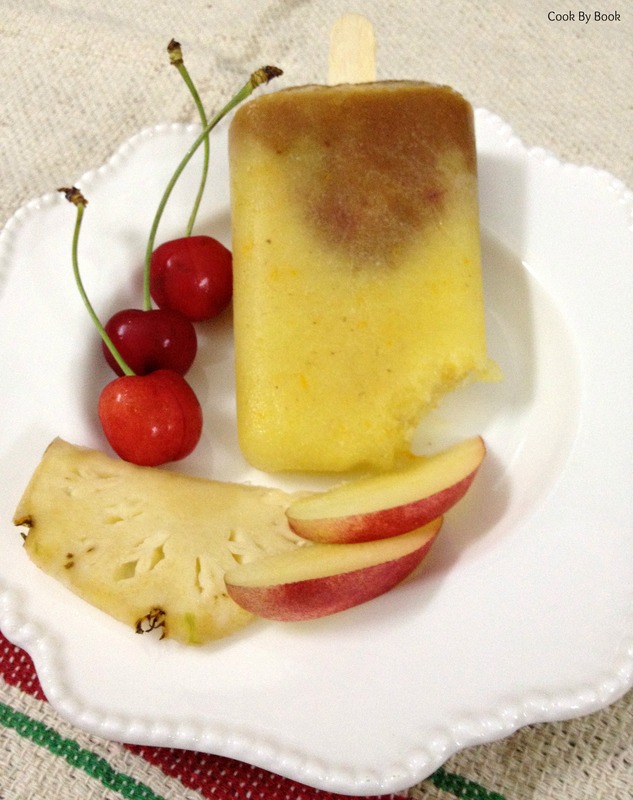 Puree 1: In a blender, blend together pineapple slices, pineapple juice and salt. Stir in orange zest to it and divide the puree among 4 popsicle moulds. Puree 2: Wash and wipe the blender dry. Add all the ingredients mentioned under puree 2 in a blender and process until smooth. 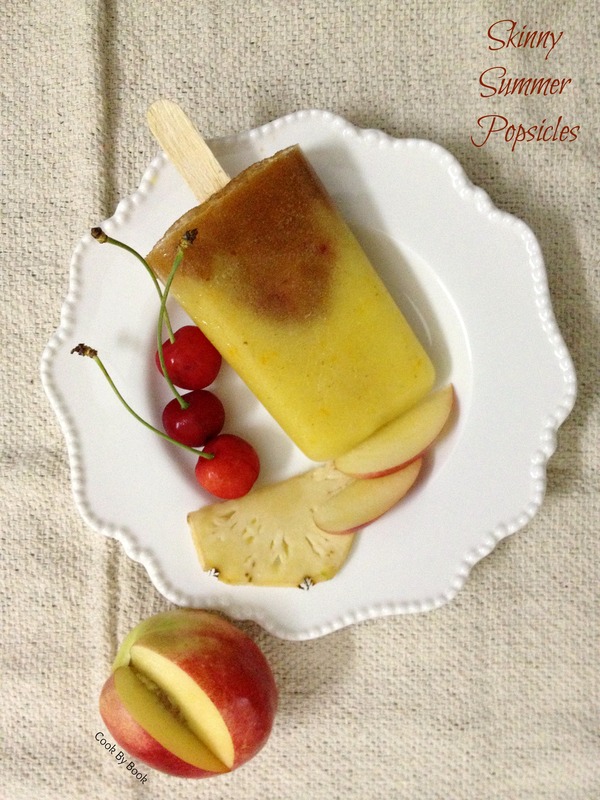 Top the popsicle moulds with puree 2, dividing equally. Insert stick in the centre of each mould, cover and freeze for about 6-7 hours. To demould, run the moulds under warm running water for 30-50 seconds. Enjoy! *Recipe can be easily doubled or tripled or quadrupled!